The woman in Revelation 12 has been the subject of many a treatise and a variety of proposals for her identification has been advanced. This is a cursive outline of the merits of Mary as the woman in Revelation 12, with a discussion of the weaknesses of this proposal as well. For the sake of brevity, the paper will hit the major points in the proposal with footnoted documentation to the fuller discussion of the issues mentioned. The identification of the woman as Mary is neither universal nor without problems, but neither is the identification of the woman in any other proposal. The Book of Revelation differs from the rest of the New Testament in a variety of respects. The form, structure and content of the Book defy self-evident description. As a result, the elements of the narrative demand further investigation to be understood. The cultural matrix of the Ancient Near East provides a number of interesting parallels to these narrative features. All of these comparisons are with small sections of the text, not an overall construct for the Book as a whole. In addition, the received text of the Book has a much larger number of variations than the rest of the NT. What follows is a brief review of background items that have relevance to the events in Chapter 12. 6-20:3 The Judgments, series of three. This structural view of the numbered lists dominating, makes the events of Chapter 12 some kind of insertion to the narrative to support the main flow in the numbered sequences. As a Òsong of triumph,Ó Chapter 12 sets the stage for the final vision and series of judgments. In this structure, Chapter 12 is an integral part of the book’s structural trajectory, not simply a supporting character to break up the pace. The vision presented of the woman in heaven and the fall of Satan are along the main path of the narrative structure. In this structure the events of Chapter 12 are part of the introductory narrative for the second section of the book. The chapter is essentially the introduction of the main characters of the conflict setting up the narrative. In his sixth century commentary, Bishop Andreas of Caesarea divided Revelation into 24 logoi, one for each elder in heaven; these are then divided into three kefalaia, one for each of the threefold nature of man. The major divisions fall on the natural boundaries of the book constituting a structural analysis of the text. Andreas splits Chapter 12 into two logoi. This structure acknowledges the ÒnumericÓ quality of the book. Revelation is replete with numbers of significance without having an easily discerned linear structure. The 24 elders are an internal element to the text and the divisions generated fall on natural boundaries. This structure sees the events of Chapter 12 as essentially two stories. The woman in the heavens is part of the description of the temple of God, concluding the trumpet series, while the battle with the dragon both in heaven and on earth are the next story. This structure would emphasize the two roles of the woman seen in Chapter 12. The first is clearly just a vision, while the second is more of a struggle between good and evil with more corporal implications. Here the seventh trumpet is joined to the vision of the woman and Chapter 12 is seen as a unified narrative. This suggests that the vision of chapter 12 is a concluding the series of trumpets. All of these conflicting analyses of the structure of Chapter 12 in Revelation demonstrate the lack of clarity in this area. The function and purpose of Chapter 12 in the flow of the current narrative is far from certain. The book of Revelation is replete with allusions and references to prior works in both the Old Testament and the Ancient Near Eastern (ANE) cultural works. Some of these references involve enough parallels in usage that some see them as written sources Revelation. Source critics, especially in the 19th century, have seen Revelation as an editorial collection of a wide variety of materials into the present form. But on the basis of unity of ideas and phrasing throughout Revelation, these source theories are soundly answered. However, this unity of composition does not preclude an influence of prior literature, both Jewish and other ANE cultures. Below is a short review of the notable parallels that John may have drawn on for Revelation Chapter 12. There were a number of myths circulating in the ANE that have similarities to the details in Chapter 12. At the same time, none is a perfect match for all of the elements in the Revelation narrative. But they do demonstrate that the images at play in Revelation have a broad usage across the region in varying details. The Jerusalem Talmud relates the story of the disappearance of the Messiah by a mysterious wind right after his birth in Bethlehem. Here an elder visits the child on successive days. He first sees the child; then when he returns on the day of the destruction of the temple to protect the child, the child has already been taken away by God in a protective wind and his mother left behind. The birth occurs on the day of the destruction of the temple by the Romans. This removal of the child immediately after birth provides some context for the similar removal that occurs in Revelation 12. By the normal Gospel accounts, one expects the Messiah to spend some time on earth after the birth, not removed immediately to heaven. This question of timing has troubled a number of commentators. The general form of a combat of the gods’ myth is outlined below. The events of chapter 12 are a near-perfect use of the general pattern. The woman of Revelation 12 is not named or otherwise explicitly identified in the narrative, thus leaving open to discussion her identity. The primary proposals are either Mary or the Christian community. Both proposals have their merits and problems. There are a number of reasons why this woman is seen as Mary. The flight to the desert can be seen as the Holy Family leaving to Egypt to escape Herod’s persecution. The Exodus association of Egypt and coming forth from the desert is found in the Gospel tradition. The exodus parallels are noted in background section above. The analogy with the flight to Egypt found appeal in the fathers, but other patristic traditions rejected this analogy. In any case, the scene is a potential secondary allusion to events in Mary’s life, if not a primary one that lends credence to the identification of the woman with Mary. The woman in Revelation 12 is depicted in images that denote a queen of heaven. Clearly a woman who is robed in the sun with the moon at her feet and a crown of 12 stars is a royal figure. The woman appearing in heaven in this royal garb would be a Goddess Queen with a variety of names and background stories in the different cultures cited above. In the context of the Christian Church there is only one real candidate for ÒQueen of Heaven,Ó and that is Mary. The path to the title ÒQueen of HeavenÓ comes from the scriptural title ÒMother of the LordÓ given Mary by Elizabeth (Luke 1:41-45), and the espousal of Mary to the Holy Spirit in accepting a son (Luke 1:31-38). From this title by Elizabeth in the Fathers commentaries we proceed to ÒMother of God.Ó From these the titles Lady, Sovereign, Mistress and Queen naturally proceed, all prior to the Fifth Century. The progression can be seen in the following examples. In the Seventh Century we see John of Thessalonica calling Mary ÒSovereign Lady of the universe.Ó  St. Andrew of Crete points out that Mary’s birth is like royalty. She enters the temple in a royal manner and is crowned in heaven as a queen. No other candidate in the Christian tradition can approach Mary’s claim to the title ÒQueen of HeavenÓ and thus the identity of this royal heavenly woman in Revelation 12. The background section above notes the parallels between Eve and the woman of Revelation 12. Mary has been called the Ònew EveÓ since the second century fathers. In this pericope we have the three elements of the Genesis 3 story, the woman, the serpent and the woman’s seed. John goes out of his way to make this connection with Genesis clear by calling the dragon the old serpent. Thus, the woman in Revelation 12 is placed in contrast to Eve in the Genesis account. The main problem with Eve in Genesis is her ÒNoÓ to the commandments of God. Mary, on the other hand, says ÒYesÓ to God’s plan in the incarnation. Mary’s agreement is associated with the Annunciation scene, but the obvious parallel of Eve and Mary allows the association of Mary to the woman of Revelation 12. In Revelation we have a clear indication of parallel between the woman and Eve, making the identification of the woman as Mary quite natural. While the identification of Mary as the woman in Revelation 12 is well attested in the patristic tradition of the Church, there is no support for this identification in the earliest fathers. Those who dispute this identification with Mary, note that those closest in time to the composition of Revelation don’t seem to see Mary in this passage. The first extant citation is from the 4th century in Epiphanius. This passage merely mentions the association exists without really endorsing the view wholeheartedly himself. He qualifies the identification with ÒI dare not affirm this with absolute certainty.Ó  But this silence of the early evidence is as much a reflection of the dearth of material interpreting Revelation at all from the time period. The references to any aspect of the book are few and far between in the extant literature. But the tepid mention by Epiphanius demonstrates that the existence of a Marian identification of the woman in the same time period was widespread enough that he could not pass the text without comment on it. These early literal interpretations are generally rejected in favor of later spiritual ones. Similarly, perhaps the later Marian interpretations of the woman in Revelation 12 should take precedence as well. The description of the birth in Chapter 12 of Revelation is not one of historical times of a woman in Bethlehem, but a description of the coming of the messiah in the cosmic realm. Christians intimately connect this messianic age to the pain of the cross. Mary has a role in experiencing this pain via the prophecy of Simeon. The placement of this birth in the middle of the book is a structural problem for some. If this is Mary giving birth to Jesus, the event should be at the start of the narrative. This would be the sequence expected from the Gospel literature. One answer to this difficulty would be to accept the structural analysis outlined above that makes Chapter 12 part of the introduction to the second part of the book. Structurally, this would place the birth at the opening of the story. Another alternative is to see the placement as consistent with the overall Johannine corpus as expressed by the Gospel of John. An all-encompassing interpretation adds value to the path of the images through the whole book. With the woman being both Mary and the Church, she also connects with the bride in chapter 21. The New Jerusalem can be seen as the same image. In the Jewish tradition the city of Zion is a Òdaughter.Ó The city is seen as a woman to such an extent that the beloved of the Song of Songs 6:4 is compared to the city of Tizra in her beauty. All of these titles and images are bound together and interlocking, and these titles become associated with Mary in patristic literature. Mary is at once a personal identification, but communal too. She is Eve, daughter Zion, and the church. These all tie in different levels of symbols. We can readily pass back and forth from the individual to the communal. With the poetic nature of the vision and narrative it is not fair to restrict the identity of the woman in Revelation 12 to just one of these. John is speaking in poetic terms and allows this woman to become all things to all people. The woman is not clearly identified in the text, even though the antagonist in the same scene is named Satan. Why would John clearly name and label the one major character and not the other? He does not identify the woman because she encompasses all the possible identities of the tradition. She is Mary. She is the Christian community. She is the teacher and mother of us all. There are about 1650 variants in only 400 verses of text, not including simple spelling issues. By comparison, the Catholic Epistles have 1100 variants in 432 verses. At the same time there are some 520 manuscripts with the Catholic Epistles and only 230 for Revelation. For the manuscript evidence of the text see Isbon Thaddeus Beckwith, The Apocalypse of John: studies in introduction with a critical and exegetical commentary (New York: Macmillan & Co., 1922), 411-14. Henry Barclay Swete, The Apocalypse of St. John the Greek text with introduction, notes and indices, 3rd ed. (London: Macmillan & Co., 1911), clxxxvi-cxcvi. James Moffatt, “The Revelation of St. John the divine,” in The expositor’s Greek Testament, ed. W. Robertson Nicoll (Grand Rapids, MI: Eerdmans, 1961), 281-85. Charles details what he sees as interpolations into the text from the transmission process and dislocations of text blocks as well. Some of these dislocations in the closing chapters of the book affect his analysis of the structure (see below). He also sees lacunae in the text that sometimes accompanied by interpolations. None of these are in Chapter 12. Robert Henry Charles, A critical and exegetical commentary on the Revelation of St. John, with introduction, notes, and indices, also the Greek text and English translation, International Critical Commentary, vol. 47 (New York: Scribner, 1920; reprint, 1950), lvi-lxi. For a discussion of the grammatical issues in the text of Revelation see section 136 of BDF, F. Blass and A. Debrunner, A Greek grammar of the New Testament and other Early Christian literature, trans. Robert W Funk (Chicago: University of Chicago Press, 1962), 75-76. Beckwith, 222-39. Moffatt, 320-22. and Swete, cxxiii-cxxvi. Some editions will include a verse 18 in Chapter 12 while others end at 17 and the text of verse 18 is the opening of Chapter 13. There is no textual difference in either case. This is simply a judgement on narrative transition between the two scenes. In verse 12 some important manuscripts drop Òand half a timeÓ from the series Òtime, times, and half a time.Ó The longer reading is supported in the oldest witnesses and the omission is easily explained by scribal error on the repeating words. Finally, in verse 18 there is a question of who stands on the seashore. Does the dragon stand there before coming out of the sea as in the oldest extant manuscripts? Or does John stand there as in the majority of manuscripts in the Byzantine text type? Details on the supporting manuscripts for these variants in chapter 12 can be found in Kurt Aland and others, The Greek New Testament (London: United Bible Society, 1966), 864-66. Zane C. Hodges and Arthur L. Farstad, The Greek New Testament According to the Majority Text, ed. Harry Sturz (Nashville: Thomas Nelson Publishers, 1982), 759-61. Text critical details on the Bohairic versions in chapter 12 are found in Herman Charles Hoskier, Concerning the date of the Bohairic Version: covering a detailed examination of the text of the Apocalypse and a review of some of the writings of the Egyptian monks (London: Bernard Quaritch, 1911), 33-40. Here Hoskier argues that the text of Sinacticus shows Coptic influences in the Apocalypse. In a broader text critical study Hoskier compiles exhaustive manuscript evidence and descriptions for the entire book of Revelation. This is a complete text critical collation of manuscript evidence, versions, and the fathers for Revelation. This includes a full description of all the manuscript sources. Volume one of this study is a catalog of manuscripts with their descriptions. The witnesses are all organized by family text type. Herman Charles Hoskier, Concerning the text of the Apocalypse: collations of all existing available Greek documents with the standard text of Stephen’s third edition, together with the testimony of versions, commentaries and fathers; a complete conspectus of all authorities, 2 vols. vol. 1 (1929). The second volume is the collation of the text with all variants in situ with notation of the source. Chapter 12 is covered here: Hoskier, Concerning the text of the Apocalypse: collations of all existing available Greek documents with the standard text of Stephen’s third edition, together with the testimony of versions, commentaries and fathers; a complete conspectus of all authorities, 310-32. An interesting text critical debate between the Alexandrine and Byzantine text form of Revelation represented by Tregelles and Tomlin respectively is here: Jacob Tomlin, Critical remarks on Dr. Tregelles’ Greek text of the Revelation and his two English versions compared with the Received Text and Authorised translation, ATLA monograph preservation program (Liverpool: Arthur Newling, 1865). This structure proposes some textual dislocations towards the end of the narrative. They represent Charles opinion on the redaction activity in the text during the editorial process. Their location near the end of the book does not affect the analysis of chapter 12. His proposed dislocations in chapters 1-20 all occur within these structural sections. Charles, xxiii-xxviii. Moffatt, 285-92. A simpler version of this Òstructure by visionÓ approach is advocated by Swete, xxxviii-xli. Both of these proposed structures would treat the material in chapters 12-13 as part of the same vision. Adela Yarbro Collins, The combat myth in the book of Revelation, Harvard dissertations in religion, vol. 9 (Missoula, MT: Scholars Press, 1976), 13-17. Raymond Brown and others, eds., Mary in the New Testament (Philadelphia: Fortress Press, 1978), 221. The exact repeating of language, especially from the opening and closing of the book, demonstrate the literary unity of Revelation. Ibid., xlvi-lii. Woman and dragon is 1-5, 13-7. The battle for heaven is 7-10, 12. Charles, lxiii, 305-14. . Gunkel would see these two scenes not as two sources, but a repetition of the vision. In this view the two scenes recount the same event from different views. These are in turn an editing of the Marduk myth to this Christian context. This editorial process removed the extensive references to the dragon from the original. Hermann Gunkel, SchË˜pfung und Chaos in Urzeit und Endzeit : eine religionsgeschichtliche Untersuchung uber Gen 1 und Ap Joh. 12, ed. Heinrich Zimmern (GË˜ttingen: Vandenhoeck und Ruprecht, 1895), 272-77. The candidates for this goddess image are Ephesian Artemis, Syrian Atargatis, and Egyptian Isis. All of these had cultic followings throughout the region. Adela Yarbro Collins, “The book of Revelation,” in The Encyclopedia of Apocalyptiscism, ed. John J. Collins (New York: The Continuum Publishing Company, 1998), 408. Collins, The combat myth, 71-76. Babylonian mother of Marduk, Damkina and Isis are proposed by Moffatt, 423. . A more detailed justification for the identification with Damkina is found in Gunkel, 385-97. Comments on Gunkel’s interpretation Pierre Prigent, Apocalypse 12; histoire de l’ex≥g≤se, Beitrπge zur Geschichte der biblischen Exegese, vol. 2 (TŸbingen: Mohr, 1959), 122-24. Vergil has serpents with blood-red crests attack Laokoon. Homer has a dragon with a blood red back, Illiad II. An Egyptian dragon named Typhon is also blood red. Moffatt, 424. . Beckwith, 623-24. Lotan of Ugaritic texts, the shining red dragon Labbu associated with Tiamat in Accadian texts and Typhon sent by Zeus in Greek texts Collins, The combat myth, 77-79. Beckwith, 614-15. Collins, The combat myth, 63-65. JŸgen U Kalms, Der Sturz des Gottesfeindes : traditionsgeschichtliche Studien zu Apokalypse 12 (Neukirchen-Vluyen: Neukirchener Verlag, 2001), 114-22. Prigent, 120-21. Moffatt, 424. Collins, The combat myth, 62-63. Collins, The combat myth, 61-62. Beckwith, 618. . Charles, 307-08. Collins, The combat myth, 79-81. Prigent, 124-27. Examples are 1 Enoch, allusions in Isaiah 14:12-20, where the rebels are confined in Sheol after the battle. Life of Adam and Eve 12-17, where the devil refuses to worship Adam as the image of God, so he is banished from heaven and hurled down to earth. Collins, The combat myth, 81-83. Other background suggested for Michael’s war with dragonÑGen 6:1-4; Enoch 6-19; Jubilees 5; Adam and Eve 12-17. Struggle of Michael with guardian of Persia in Dan 10:13, 20; 12:1-2. Brown and others, eds., 228. The evil beasts alluded to by this figure are found in Daniel 7, Job 7:12, Psalm 74:14, 89:10, Isaiah 27:1, Ezekiel 32:2, Wisdom 2:24 as cited in Beckwith, 623-24. Moffatt, 426. Swete, 149. Sun around woman with the 12 stars as the patriarchs, is seen by many as an allusion to Joseph’s dream about his brothers in Genesis 37. A woman’s beauty is described in terms of the sun and moon in Song of Songs 6:10 and Wisdom 7:29. God wears the sun as a cloak in Psalm 104:2. Psalms 8 uses the images of the heavens as the evidence of God’s glory. Beckwith, 622-23. Swete, 147. Some would see the escape of the woman into the desert as the Christian community leaving Jerusalem during the siege and ultimate destruction of the city by Rome in 70 AD. But this is the minority opinion; most see the Exodus references in the scene. Elijah’s protection in the wilderness in 3 Kings 17 is a similar allusion to the exodus in the Old Testament. An example from intertestamental-literature is found in the Assumption of Moses 108. The Eagle’s wings is an image from Exodus 19:4 & Deuteronomy 32:11. Isaiah 40:31 uses the image in a similar way. The flood of the dragon’s mouth is like escaping pharaoh through the Red Sea in Exodus 14. Beckwith, 628-30. Brown and others, eds., 231. Andr≥ Feuillet, Jesus and His mother : according to the Lucan infancy narratives, and according to St. John : the role of the Virgin Mary in salvation history and the place of woman in the Church, trans. Leonard Maluf ( Still River, Ma: St. Bede’s Publications, 1984), 23-25. Josephine Massyngberde Ford, Revelation, introduction, translation and commentary, ed. David Noel Freedman, Anchor Bible Commentary, vol. 38 (Garden City, NY: Doubleday, 1975), 191-93. Moffatt, 427-28. Swete. Lucien Cerfaux, L’Apocalypse de Saint Jean lue aux chr≥tiens, ed. Jules Cambier, Lectio divina, vol. 17 (Paris: ƒditions du Cerf, 1964), 109-10. The struggle between the seed of the woman and the serpent will culminate with the woman’s male seed crushing the serpent. The grammar can be read to see a future sense of an individual male role for this event. Stephen Rowe, “An exegetical approach to Gen. 3:15,” Marian Studies 12 (1961): 63-66. Apocalypse of Baruch 4, 4 Esdra 9:38-10:59 as cited in Moffatt, 424. Beracoth II. 5 as cited in Beckwith, 614. Moffatt, 423. .Collins argues that this combat myth pattern is repeated in all the series of sevens in Revelation, not just in chapter 12. Collins, The combat myth, 59-61. A review the arguments in favor of prior written Jewish and Christian sources for Revelation 12 can be found in Prigent, 128-33. Beckwith, 615-16. Brown and others, eds., 22. Charles, 299. Ford, 191. Roger Cowley, The traditional interpretation of the Apocalypse of St. John in the Ethiopian Orthodox Church, University of Cambridge Oriental Publications, vol. 33 (New York: University of Cambridge Press, 1983), 117. Moffatt, 425. . Swete, 151. .
 A typical application of the flight to Egypt allusion is in Bishop of Tricca Oecumenius, The complete commentary of Oecumenius on the Apocalypse, now printed for the first time from manuscripts at Messina, Rome, Salonika, and Athos, ed. Herman Charles Hoskier, Humanistic Series, vol. 23 (Ann Arbor, MI: University of Michigan Press, 1928), 142. Another is in the Ethiopian Amharic andemta in Cowley, 291-92. The application of Revelation to actual historical times is unusual in Oecumenius. He takes most of Revelation eschatologically. Only the woman in chapter 12, the six seals and the 1000-year reign are seen as events already fulfilled by his time, as noted by Cliff DuRousseau, “The commentary of Oecumenius on the Apocalypse of John,” Biblical Research 29 (1984): 31-32. Rejecting the application of the flight to Egypt in Revelation 12 is the Ethiopian commentary Tergwame Qπlπmsis in Cowley, 120. Eustace Smith, “The scriptural basis for Mary’s queenship,” Marian Studies 4 (1953): 112-13. This progression of titles of Mary is outlined in Malachi Donnelly, “The queenship of Mary during the patristic period,” Marian Studies 4 (1953): 86-91. Other contemporaneous examples are provided here as well. Donnelly: 94. St. John of Damascus is noted as the chief apologist for ÒQueen of HeavenÓ as a title for Mary in this period. Numerous other examples are also cited. Ibid. : 97. The connection of Mary to Eve by opposites is first implied by Justin and first explicit by Iraenaus. Dominic Unger, “Use of sacred scripture in Mariology,” Marian Studies 1 (1950): 93-95. A review of pre-sixth century connections of Mary to Eve in the Genesis 3 story is in Shea’s article. The article argues that Gen 3:15 is interpreted as a reference to Mary at least implicitly from a very early period in Patristic exegesis. The references are arranged chronologically and include: Justin, Ireanus, Cyprian, Serapion, Ephraem, Ambrose, Pseudo-Jerome, Epiphanius, Prudenyius, Isadore of Pelusium, Hesychius, Leo, Chrysippus, and Isadore of Seville. Revelation 12 is explicitly linked to this interpretation by Ephrem Dominic J. Shea, “Patristic interpretation of the Protoevangelium,” Marian Studies 12 (1961): 130. and Hesychius. Shea: 153. Other samples of Patristic literature with Eve/Mary typology are: Irenaeus Bertrand Buby, Mary of Galilee, vol. III The Marian Heritage of the Early Church (New York: Alba House, 1996), 18-28. & Luigi Gambero, Mary and the fathers of the Church (San Francisco: Ignatius Press, 1999), 52-58. ; Ephrem the Syrian Buby, 318-21. & Gambero, 116-19. ; Tertullian Buby, 82-84. ; Augustine Buby, 186-90. , Epiphanius Gambero, 124-25. ; Amphilochius of Iconium Buby, 252-53. & Gambero, 168-70. ; Cyril of Jerusalem Buby, 213-14. . The parallel of Eve & Mary in Revelation 12 in the context of the Papal bull on the Assumption of Mary is detailed in George Bissonnette, “The twelfth chapter of the Apocalypse and our Lady’s assumption,” Marian Studies 2 (1951): 171-73. This connection to the Assumption is deemed untenable by Feuillet, 25-26. But he still sees the Eve to Mary connection in the text. For an outline of the difficulties with the Òwoman as MaryÓ position see Hildegard Gollinger, Das grosse Zeichen von Apokalypse 12, Stuttgarter biblische Monographien, vol. 11 (WŸrzburg: Echter, 1971), 27-41. Surveys of patristic interpretation of revelation can be found in Beckwith, 319-33. Charles, xcvii-ciii. Prigent, 3-9. Swete, cxcvii-ccv. Haer. 78, 11; PG 42, 716 B-C as cited in, Gambero, 126. However, the dating of this particular passage in Epiphanius could be much later, as it is preserved in quotation only. Fathers before Origen are almost universally literal in interpretation. Origen advocates for spiritual interpretation. Augustine proposes a melding of the two. Collins, “The book of Revelation,” 409-11. Also see the surveys of patristic interpretation mentioned above. Paul in Romans 9:4-5 & Galatians 4:26 demonstrates that even in the New Testament period this was one way Christians thought of the birth of Jesus. Moffatt, 424. Commentators who identify the woman as the Church include, William Barclay, The Revelation of John, Revised ed., The daily study Bible series, vol. 2 (Philadelphia: The Westminster Press, 1976), 75. Beckwith, 621-22. Bertrand Buby, Mary of Galilee, vol. I Mary in the New Testament (New York: Alba House, 1994), 146-53. Robert Bratcher, A translator’s guide to the Revelation to John, Helps for translators (London: United Bible Society, 1984), 96. Ford, 195-96. Wilfrid J. Harrington, Revelation, ed. Daniel J. Harrington, Sacra Pagina Series, vol. 16 (Collegeville, MN: Liturgical Press, 1993), 130-31. Moffatt, 425. and Prigent, 141-43. For a survey of the woman as a community interpretation see Gollinger, 42-72. 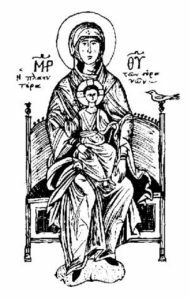 Samplings of patristic thought on Mary/Church typology are Clement Buby, Mary of Galilee, 72-74. , Irenaeus Buby, Mary of Galilee, 24-28. Ephrem the Syrian Gambero, 115-16. ; Ambrose of Milan Gambero, 198-99. ; Augustine Buby, Mary of Galilee, 186-90. & Gambero, 222-25. ; Cyril of Alexandria Buby, Mary of Galilee, 295-98. ; Isadore of Seville Gambero, 376-77. Feuillet, 26-27. In reviewing the earliest Greek and Latin commentators, Swete notes that the two views Mary and the Church are not wholly inconsistent. Swete, 148. Other commentators who see a dual meaning, Mary and the Church, in the text are: Brown and others, eds., 232-35. Cerfaux, 102-03. and Andr≥ Feuillet, The Apocalypse, trans. Thomas E. Crane (Staten Island, NY: Alba House, 1965), 115-16. However, there are ancient authorities that are unambiguous in identifying the woman as the Church without reference to Mary at all, Tergwame Qπlπmsis in the Ethiopian tradition in, Cowley, 116. Feuillet, Jesus and His mother, 205. The Joseph allegory is from Oecumenius, 137. The Numbers parallel is found in Amharic andemta in Ethiopian commentaries. Cowley, 288-89. The Ethiopian commentary Tergwame Qπlπmsis takes this position. Cowley, 120. Brown and others, eds., 230-31. Prigent, 142. Brown notes that on the publication of this Qumran Psalm most commentators immediately linked this to Revelation 12 based on similar messianic views. While Brown acknowledges the similarities, he instead argues for a parallel with Revelation 3 based on content seeing this as eschatological rather than messianic. Nevertheless, I suggest the connection between the pains of birth and the coming messianic age seems clear. Schuyler Brown, “Deliverance from the crucible: some further reflexions on 1 QH iii. 1-18,” New Testament Studies 14 (1967-68). Collins does see the text as an allusion to the birth of the messiah. But the parallel to Revelation 12 is weak because the birth and the adversary are the only points of narrative contact. Collins, The combat myth, 61-69. Andr≥ Feuillet, Johannine studies, trans. Thomas E. Crane (Staten Island, NY: Alba House, 1965), 267-70. Brown and others, eds., Mary in the New Testament, 230-31. Harrington, 129-30. Early commentators with this interpretation include Hippolytus, Augustine and Andreas. Swete, 148. Isaiah 26:17; 54:1; 66:7-9; Micah 4:10. Isaiah 26:17; 66:7; 60:19-20. A summary of Israel prophetic references is in Brown and others, eds., Mary in the New Testament, 230-31. The other uses of basanizo in Revelation are 9:5, 11:10, 14:10, 11, 18:7, 10, 15, & 20:10. Feuillet, Johannine studies, 262-63. Feuillet, The Apocalypse, 116-17. Feuillet, Jesus and His mother, 20. Zechariah 12:10. Feuillet, Jesus and His mother, 47-53. Charles, xxix-l. Moffatt, 320-24. and Swete, cxxvi-cxxx. Beckwith presents the opposite view that the two authors could not have been from the same school based on the differences in language, theology and eschatology. Beckwith, 353-62. This is the position taken by the Amharic andemta commentary on Revelation. All three identifications of the woman are asserted as operative simultaneously. Cowley, 287-88. Brown and others, eds., Mary in the New Testament, 235. Buby, Mary of Galilee, 146-47. Feuillet, Johannine studies, 275-76. Aland, Kurt, Matthew Black, Bruce Metzger, and Allen Wilgren. The Greek New Testament. London: United Bible Society, 1966. Barclay, William. The Revelation of John Vol. 2. Revised ed. The daily study Bible series. Philadelphia: The Westminster Press, 1976. Beckwith, Isbon Thaddeus. The Apocalypse of John: studies in introduction with a critical and exegetical commentary. New York: Macmillan & Co., 1922. Bissonnette, George. “The twelfth chapter of the Apocalypse and our Lady’s assumption.” Marian Studies 2 (1951): 170-77. Blass, F., and A. Debrunner. A Greek grammar of the New Testament and other Early Christian literature. Translated by Robert W Funk. Chicago: University of Chicago Press, 1962. Bratcher, Robert. A translator’s guide to the Revelation to John Helps for translators. London: United Bible Society, 1984. Brown, Raymond, Karl P. Donfried, Joseph Fitzmyer, and John Reumann, eds. Mary in the New Testament. Philadelphia: Fortress Press, 1978. Brown, Schuyler. “Deliverance from the crucible: some further reflexions on 1 QH iii. 1-18.” New Testament Studies 14 (1967-68): 247-59. Buby, Bertrand. Mary of Galilee Vol. I Mary in the New Testament. New York: Alba House, 1994. ________. Mary of Galilee Vol. III The Marian Heritage of the Early Church. New York: Alba House, 1996. Cerfaux, Lucien. L’Apocalypse de Saint Jean lue aux chr≥tiens Vol. 17 Lectio divina, ed. Jules Cambier. Paris: ƒditions du Cerf, 1964. Charles, Robert Henry. A critical and exegetical commentary on the Revelation of St. John, with introduction, notes, and indices, also the Greek text and English translation Vol. 47 International Critical Commentary. New York: Scribner, 1920. Reprint, 1950. Collins, Adela Yarbro. The combat myth in the book of Revelation Vol. 9 Harvard dissertations in religion. Missoula, MT: Scholars Press, 1976. ________. “The book of Revelation.” In The Encyclopedia of Apocalyptiscism, ed. John J. Collins. Vol. 1, 384-414. New York: The Continuum Publishing Company, 1998. Cowley, Roger. The traditional interpretation of the Apocalypse of St. John in the Ethiopian Orthodox Church Vol. 33 University of Cambridge Oriental Publications. New York: University of Cambridge Press, 1983. Donnelly, Malachi. 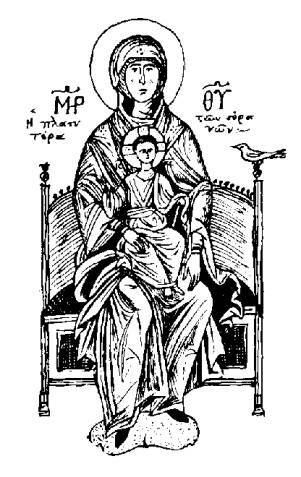 “The queenship of Mary during the patristic period.” Marian Studies 4 (1953): 82-108. DuRousseau, Cliff. “The commentary of Oecumenius on the Apocalypse of John.” Biblical Research 29 (1984): 21-34. Feuillet, Andr≥. The Apocalypse. Translated by Thomas E. Crane. Staten Island, NY: Alba House, 1965. ________. Johannine studies. Translated by Thomas E. Crane. Staten Island, NY: Alba House, 1965. ________. Jesus and His mother : according to the Lucan infancy narratives, and according to St. John : the role of the Virgin Mary in salvation history and the place of woman in the Church. Translated by Leonard Maluf. Still River, Ma: St. Bede’s Publications, 1984. Ford, Josephine Massyngberde. Revelation, introduction, translation and commentary Vol. 38 Anchor Bible Commentary, ed. David Noel Freedman. Garden City, NY: Doubleday, 1975. Gollinger, Hildegard. Das grosse Zeichen von Apokalypse 12 Vol. 11 Stuttgarter biblische Monographien. WŸrzburg: Echter, 1971. Gunkel, Hermann. SchË˜pfung und Chaos in Urzeit und Endzeit : eine religionsgeschichtliche Untersuchung uber Gen 1 und Ap Joh 12, ed. Heinrich Zimmern. GË˜ttingen: Vandenhoeck und Ruprecht, 1895. Harrington, Wilfrid J. Revelation Vol. 16 Sacra Pagina Series, ed. Daniel J. Harrington. Collegeville, MN: Liturgical Press, 1993. Hodges, Zane C., and Arthur L. Farstad. The Greek New Testament According to the Majority Text, ed. Harry Sturz. Nashville: Thomas Nelson Publishers, 1982. Hoskier, Herman Charles. Concerning the date of the Bohairic Version: covering a detailed examination of the text of the Apocalypse and a review of some of the writings of the Egyptian monks. London: Bernard Quaritch, 1911. ________. Concerning the text of the Apocalypse: collations of all existing available Greek documents with the standard text of Stephen’s third edition, together with the testimony of versions, commentaries and fathers; a complete conspectus of all authorities Vol. 1. 2 vols., 1929. Kalms, JŸgen U. Der Sturz des Gottesfeindes : traditionsgeschichtliche Studien zu Apokalypse 12. Neukirchen-Vluyen: Neukirchener Verlag, 2001. Moffatt, James. “The Revelation of St. John the divine.” In The expositor’s Greek Testament, ed. W. Robertson Nicoll. Vol. V, 279-494. Grand Rapids, MI: Eerdmans, 1961. Oecumenius, Bishop of Tricca. The complete commentary of Oecumenius on the Apocalypse, now printed for the first time from manuscripts at messina, Rome, Salonika, and Athos Vol. 23 Humanistic Series, ed. Herman Charles Hoskier. Ann Arbor, MI: University of Michigan Press, 1928. Prigent, Pierre. Apocalypse 12; histoire de l’ex≥g≤se Vol. 2 Beitrπge zur Geschichte der biblischen Exegese. TŸbingen: Mohr, 1959. Rowe, Stephen. “An exegetical approach to Gen. 3:15.” Marian Studies 12 (1961): 49-79. Shea, Dominic J. “Patristic interpretation of the Protoevangelium.” Marian Studies 12 (1961): 111-64. Smith, Eustace. “The scriptural basis for Mary’s queenship.” Marian Studies 4 (1953): 109-17. Swete, Henry Barclay. The Apocalypse of St. John the Greek text with introduction, notes and indices. 3rd ed. London: Macmillan & Co., 1911. Tomlin, Jacob. Critical remarks on Dr. Tregelles’ Greek text of the Revelation and his two English versions compared with the Received Text and Authorised translation ATLA monograph preservation program. Liverpool: Arthur Newling, 1865. Unger, Dominic. “Use of sacred scripture in Mariology.” Marian Studies 1 (1950): 67-116.